I have to be honest that I used to hate putting on face mask. I think I only do once a month, I'm more like a sleeping mask person, cuz all I have to do is apply and sleep. Till one day, I read an article on facebook about Fan Bing Bing with her addiction with face mask. 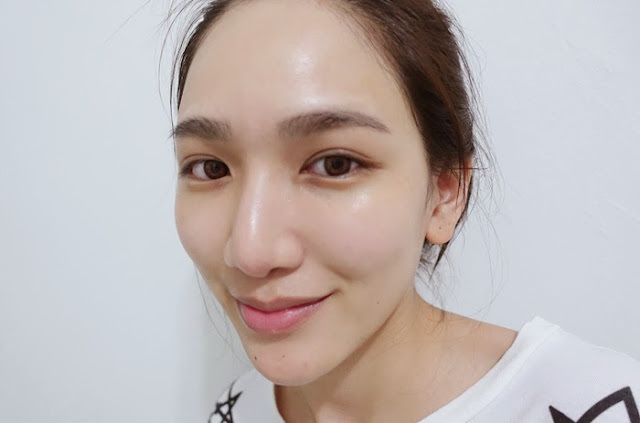 Paparazzi has tons of photos with her in mask, she told the media that she needs to keep her skin hydrated (to keep her skin young) so she has tons of facial mask standby with her. From then onwards, I told myself to not to be lazy, and I've been using facial mask as frequent as possible ( at least once a week ). BUT STILL, I'm very picky when it comes to my masks. I only love using hydrogel mask. For those who don't know what's a hydrogel mask, it's something quite new to the market (prolly introduced into the market 1-2years ago ) and not all brands has it. Hydrogel masks fits so much better than paper mask. I personally love the texture and it's gentler to the face. And it looks not as ugly as the paper ones lol. Hydrogel masks in the market are pretty limited. 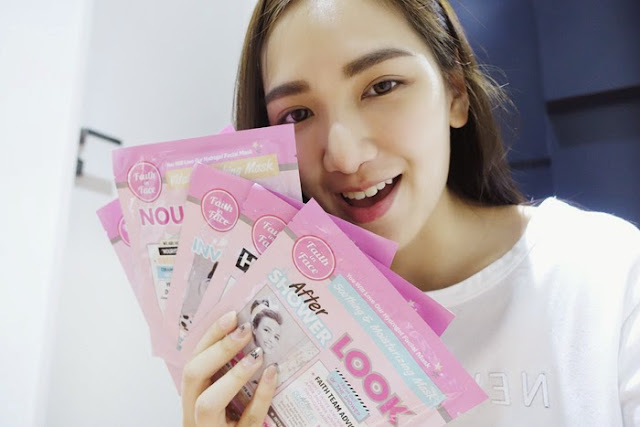 I'm glad that I get to try Faith in Face's hydrogel masks as it's very popular in Asia! Faith in Face was originated from Korea – a plus point for the mask as it would suit Asian skin. 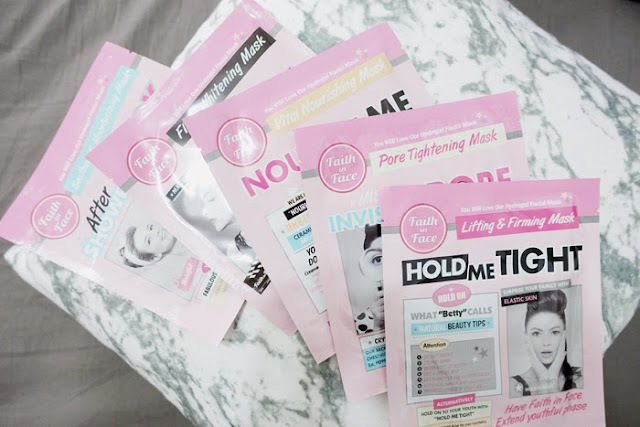 Faith in Face has 5 types of hydrogel masks. I just came back from USA and the weather there was really dry and after a long flight, I definitely need a lot of Hydration. So I decided to try on the After Shower Look and here's how it looks like. After Shower Look Hydrogel Mask test! All Faith in Face hydrogel masks come in 2 sheets for better fit purpose. Yes, I am very happy with the fit and texture; no dropping or dripping happened during my application. It's very hard for me to find a good mask as my skin sometimes get very sensitive. 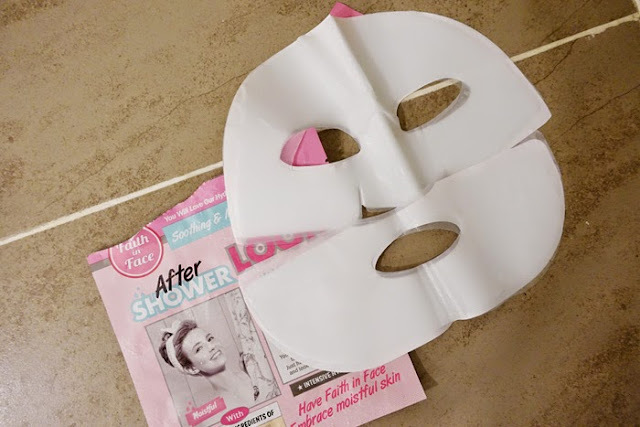 Well, good thing about hydrogel masks, unlike paper mask, sometimes when you “over-timed” your paper face mask, they give you opposite effect, where it absorbs your face nutrients instead of your face absorbing from your mask, so you get the very tight feeling when your paper dries up. No good. Skin felt so hydrated after using After Shower Look mask. I can immediately see the skin turns radiant after taking of the mask! Can even feel the bouncy-ness of the skin. AWESOME. 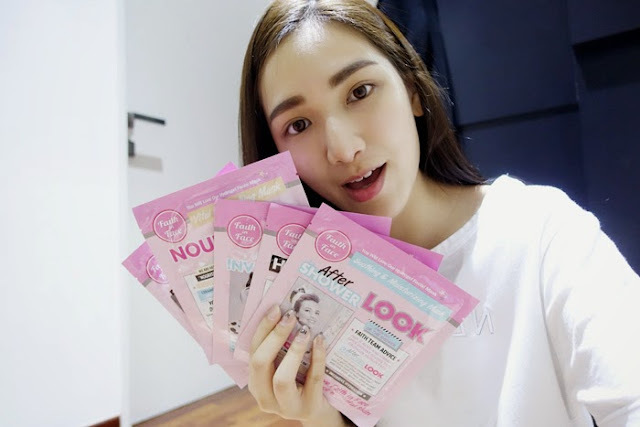 Nourish Me Hydrogel Mask test! I realize a little difference, Nourish Me hydrogel mask is a lil bit yellowish and it smells like honey! Totally feel like eating it cuz the texture makes it like a honey jello. Also, you can actually feel that your skin is absorbing the hydrogel by the before & after thickness of the mask. This is when I just put it on. MY SKIN AFTER USING THE MASK. Can you see the glow on ma face? Black & White Film Star Hydrogel Mask test! Sometimes using whitening mask will make your skin feels dry but with this one doesn't. It gives the whitening effect and also hydration at the same time. Plus point for Faith in Face Hydrogel Masks. Tempted to try these hydrogel masks for yourself already? Faith in Face hydrogel masks are now available at major Watson’s outlets at RM11.90 per piece (inclusive of GST) – which I have to say a very good value for money for hydrogel masks. Step 3: Winners will be announced via Faith in Face FB page on 31 May 2015. You’ll also be notified by call & email on how you can redeem your prizes! There're only limited Faith in Face Hydrogel Mask Goodie Sets to be redeem, every 10th participant who emailed them will be the lucky winner! Website is in Korean language, so visit their FB Page for English information. she already mentioned u can buy from at watsons.